Prices for full Test match “season” tickets will range from US$60 (grounds and mounds) to US$300 (premium seats), with day tickets also available for Tests ranging from $15 to $75 per day. Tickets for the ODIs and T20s range from US$15 to $75. Tickets from the box offices and ticket booths will be available approximately 2 weeks before each game in each country. A percentage of the stadium seats will be reserved from general sale and held back for local fans who do not have internet access and/or prefer to buy from the ticket booths and box offices. These will only be available at the local box office with the presentation of Government- issued IDs. Each ID is limited to four (4) tickets at local price. “This is the tour that the whole of the region waits for and we’re looking forward to our fans creating the famous West Indies atmosphere and hospitality to welcome England. We’re ensuring that every fan can access tickets by offering both online sales now and then ticket booth sales from January. 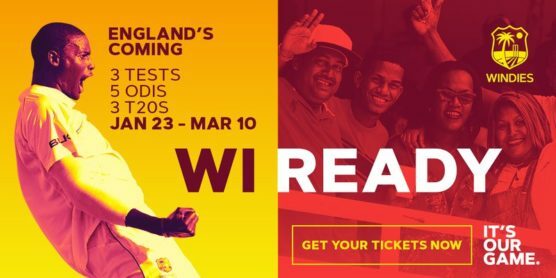 We’re providing a range of ticket choices for WINDIES and England fans and now is the time to buy your tickets to guarantee your place at these must-see matches. We want our fans to make this yet another memorable International Home Series.” – Commercial Director, Dominic Warne. In 2016 my boss went to the tour in Barbados – they were not in the party stand, but were in a very nice tented area and paid a bit more money. Do you know if there will be the same area this year and when the tickets will go on sale? Hi, I’m staying on the island until the 22nd November then returning to the UK. Back again for the first test in January, I require 12 party stand tickets day 1 and 10 party stand tickets day 2. I would like these before I return to the UK as I will be personally delivering these all over the country, as the Christmas post can prove difficult, can you assist me please. Unfortunately, we do not have any information as yet regarding the release date for party stand tickets. We however would like to urge you to stay abreast with our news updates via our web and social media pages where we will publish updates as soon as they become available. Would like to purchase 2tickets for England v West Indies odi on Feb 22 2019 at the Kensington oval please , I really would love to treat my husband for his birthday whilst we are on holiday there . Please can you let me know how to get tickets for this date only . You can purchase tickets via this link . The web portal will display all the Barbados matches and upon selecting the specific date, you will be able to choose the section of interest where you will be seated here at the Oval. Hope to see you there! How do you access the hot tub on the boundary? Is there a charge for using it or do you have to pre order tickets? how do i buy tickets for the party stand at kensington oval? are they now on sale? Im trying to buy party stand tickets for Friday 25th January for 1 day. Can you advise how I do this? When are the party stand tickets on sale please?